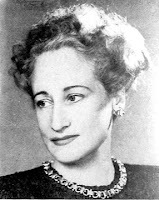 Thank you for the interesting background on Vera Caspary and THICKER THAN WATER. Now, because I very much respect your literary tastes and judgment, I have one more author and at least one more novel to add to my ever-growing list of "must read" books. Good luck finding a copy! My early searches through local libraries and all the state's university libraries confirms your assertion that I will need luck finding a copy. Ah, well, the used bookstores in the area often contain treasures and surprises, so those shelves will be the next targets. In any event, I still have plenty to keep me quite busy. The treasure quest, though, is always stimulating. So, I will not lose hope.